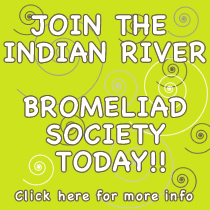 The Indian River Bromeliad Society is a non-profit organization. Our goals and purpose of this society is to promote this wonderful group of plants called bromeliads. Generally speaking, bromeliads are easy to care for & grow readily with a minimum amount of maintenance. There is such a vast number of varieties, shapes, colors, and forms. There is something for everyone! We want to promote interest in the propagation, growth, culture, and scientific study of bromeliads as well as generate community interest in bromeliads. We have speakers, educational workshops, monthly raffles, refreshments, vendor plants sales, vendor auctions, show & tell, field trips to nurseries & gardens, trips to Bromeliad shows & conferences , as well as cultivating friendships. 2019 Indian River Bromeliad Society. All Rights Reserved.